The modules are delivered to the construction site by road transport. Installation requires a crane with a high load capacity and outreach, carefully adjusted to the individual geometric conditions of the facility and the size and weight of the prepared modules. 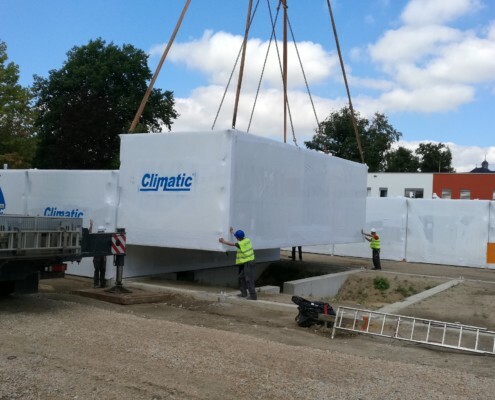 The necessary crane and transport equipment is provided by Climatic, which also carries out the installation. Thanks to the high degree of module prefabrication, the installation time, construction noise and dust emissions can be reduced to the minimum. This is especially important in medical facilities. In addition, the modular system allows performing prefabrication and installation work in the winter, when work must be stopped in traditional construction technologies.